The Vivotek ND8212W is a 4 channel wireless network video recorder with a Linux-based operating system. It supports a single 3.5" HDD up to 6TB in size. This wireless NVR connects to IP cameras via WiFi connection so no network cables have to be run. Simply connect NVR to a nearby outlet and run the Vivotek Installation Wizard. On average, the Vivotek Installation Wizard takes less than 4 minutes to locate the cameras on the network and sync them to the NVR for recording. This ease of setup negates the typical hassles associated with network based video recorders. Up to 40 days of 24/7 continuous recording is possible when using a 6TB hard drive. Users can view the recorded video remotely using the free VIVOCloud and iViewer apps for the both iOS and Android mobile devices. The VIVOCloud features push notifications so that users are alerted and automatically provided with the video playback when the system is triggered by an alarm notification. This creates a harmonious blend of security and convenience for small scale surveillance applications. NVR Specification Sheet - Click Here! 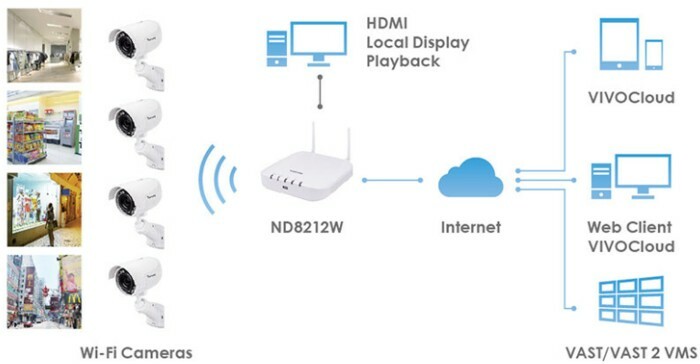 Providing users with the ultimate intuitive experience, the WPS feature connects the IP cameras to the NVR without having any networking experience. Just run the Auto Setup Wizard and in a matter of 4 minutes the cameras are bound with the NVR. From there, just click record and the premises is secured. The diagram below illustrates how these Vivotek wireless camera systems can be configured for remote viewing from the various web and smartphone applications. The free VivoCloud app makes remote accessibility easy. The latest P2P (Point to Point) technology allows the user to connect to their system by simply scanning a QR-code and installing the app. Users can view their live video and recorded video playback from almost anywhere in the world. Push notifications give users instant alerts when suspicious activity occurs so that may react quickly. The VivoCloud app is available for iOS, Android, and PC. The ND8212W NVR supports Fisheye camera de-warping and four simultaneous display modes. The display modes include LiveView, Playback, Snapshot, and Instant Playback. A Vivotek Fisheye camera is required for the de-warping feature.